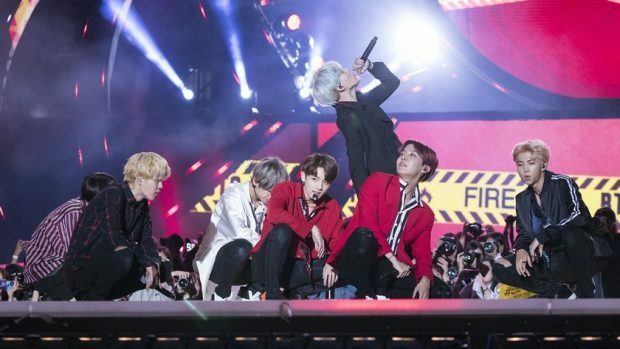 South Korean boy band BTS became the first K-pop band to break into the top 10 of the US album charts earlier this month. The group’s latest EP, Love Yourself: Her, landed at number seven so fittingly here are seven things you need to know about the internet’s favourite boy band. With almost 10 million followers on Twitter, six million on Instagram and a further five million on Facebook, it’s fair to say their online reach is pretty extensive. In fact, they were named the most retweeted artist on Twitter last year. Their army of fans also helped them beat Justin Bieber to win the Billboard award for Top Social Artist earlier this year. In addition to their latest album surging into the Billboard charts top 10, the record’s lead single DNA also made it into the hot 100. BTS are hoping to pick up even more fans in the US as they take to the stage at the American Music Awards next week. Reports claim the band will also drop in on The Ellen DeGeneres Show and Jimmy Kimmel’s late evening programme during their trip to the States. Part of their appeal is the group’s more thoughtful approach to the energetic norms of K-pop. Songs about loneliness, gender politics and social commentary are frequent – notably the lyrics on Love Yourself are gender neutral. One stand out track is Go Go, which reflects on economic hardship among South Korea’s youth.